A good one is so rare?" "Hold it there dog just a bit,"
Many people have seen pictures of creative grooming. Reactions run from disbelief to laughter to pure riducle to admiration. 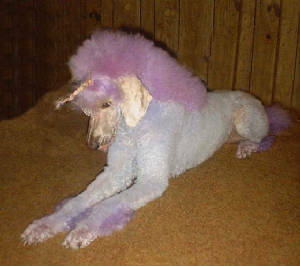 It takes a lot of character to be able to withstand the reactions when your dog is in technicolour! I had to learn about colourizing a dog the hard way. When I first became interested in colouring it was a highly kept secret amongst compeitors. However I was able to finangle some info and the rest I learned as I went. 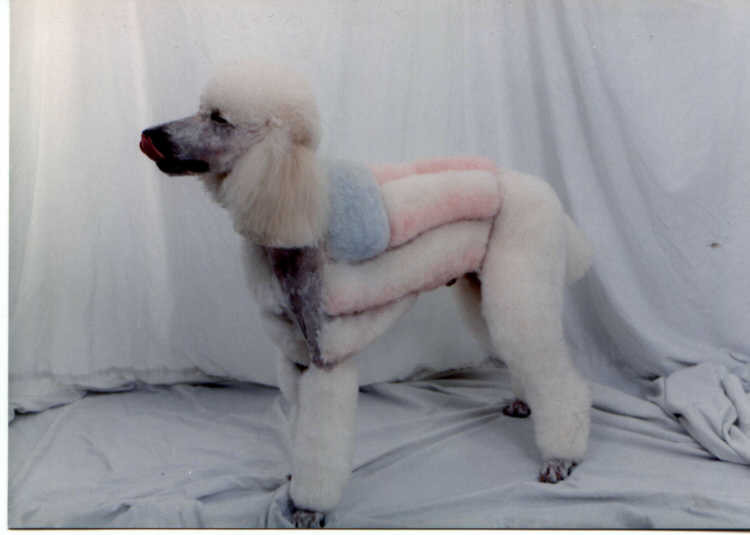 I debuted in my first grooming competition ever at Heshey PA in 1999 with the Yankee Poodle Dandy. Almost a year in the making it was a very difficult trim to do for the first time in competition. I learned once again from my competitors..keep it easy! Although I finished I did not place as I was against the top top creative groomers in the country but at least I finished. 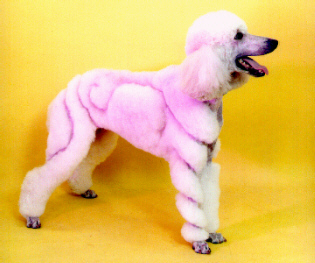 I was planning on returning to Groom Expo in 2000 with a show clip in the poodle ring but that was never to happen. Creative grooming was the funnest part of grooming for me and while I do still do it on occasion at home for fun it is one of the things I did as a professional that I have had to leave behind. Now that I am grooming again I am beginning a new creative aspect for my dog watch for future posts! Ever seen a Unicorn? This is the first creative groom I did after my car accident. My daughter was going out as a Princess for Halloween and wanted a pony well I told her a renaissance lady was always on the lookout for the legendary Unicorn!